It's easy to feel like you can grow a loyal audience in no time using the latest growth hacks or Twitter and Facebook tricks. But the truth is, it's not that simple. Growing an audience is hard. You have to put in a lot of work. And there's no 1-2-3 solution. In this post, I'm happy to share some of our experiences from building an audience at Buffer alongside six key ingredients to successfully building an audience. It is no secret that we live in an age of information overload. Yet many of us are in search of a larger audience. More readers on our blog. A bigger following across social media. A group of people who read, engage with and amplify everything we share. The problem is, we live in an attention economy. Everyone is vying for consumer attention, and there's only so much to go around. We all have 24 hours in a day. There's nothing we can do to change that. 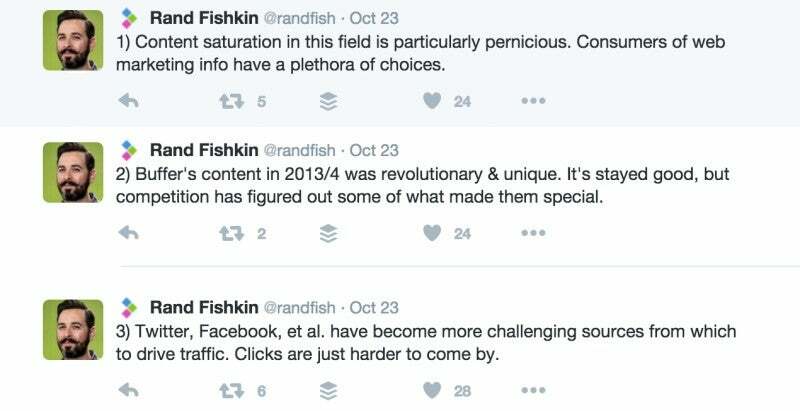 Each day on Facebook alone we are potentially exposed to 1,500 pieces of content. When you add in Tweets, Snapchats, Instagram posts and all the other content we're exposed to daily, it's easy to see why it can be so hard to break through as a content creator. Each day we have a tiny window to grab people's attention and make an impact with our content. And many of us are in search of that one, elusive thing that'll get us rolling on the path to success. But that's not how it works. Think of yourself as a Major League Baseball player, for every home run, for every cheer from the crowd, there are thousands of practice swings and plenty of strikeouts. Content is no different. You need to step up to the plate and bring your best every day if you want to be a success. There's no shortcut to building an audience. It's a long, winding road. And it takes a number of elements to succeed. Below I'd love to share some of the key ingredients to building at audience. If you play close attention to the people who popped on Vine, or the people who popped in the early days of Snapchat, or Instagram, they all happened to be the Christopher Columbus of their platforms. They were early. So as those platforms took off, they developed disproportionate amounts of followers as new users joined and found them. A study from Harvard Business Review found that companies identified as believing strongly in the benefits of adopting new technologies receive a "first-mover advantage" -- and are more likely to lead in both revenue growth and market position than their peers. The same theory applies to new social platforms too. As an early adopter, you can gain first mover advantage and, as Gary Vaynerchuk said, you have the chance to become "the Christopher Columbus" of that platform. By focusing on what's next and experimenting with new platforms and technologies, you have an opportunity to jump ahead of the competitionand build an audience before the platform is too crowded. Shaun McBride, better known as Shonduras online, is one of Snapchat's first homegrown celebrities, and brands are spending upwards of $30,000 for advertising deals with him and other Snapchat stars. Before Snapchat, Shonduras honed his skills as an artist. Snapchat merely provided a platform for him to share his skills with the world. If you want to be an influential writer, practice writing: on your blog, on Medium, on Twitter, or anywhere you can scribble down a few words. If you love to create video, experiment with Vine, YouTube, Snapchat, and Beme. Whatever your skill set, find new ways to be creative. Hone your talents. And then when the next big platform launches, jump on it and set the trends there. For periods in my writing life, I've relied on content that is ‘good enough', content that gets a point across. That ticks a box. But doesn't reflect me or my personal beliefs. On reflection, this doesn't feel the way to break through and build an audience. Great content should make you feel vulnerable and a little discomfort upon publishing. As Jory MacKay points out over at Crew, when you approach a new subject, ask yourself ‘how can I cover this in a way that only I can?' 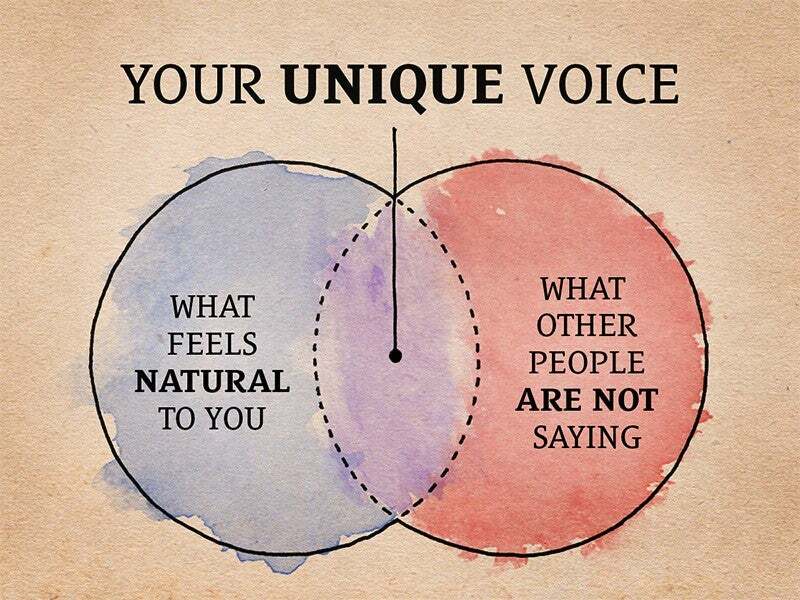 Your voice is what will make you stand out from the crowd. Saying the same things as everyone else, in the same style will only add to the noise. And you'll get lost in the endless sea of content published every day. At Buffer, we're super lucky to be well-known for our content. But our rise wasn't an overnight success -- and certainly didn't come easy. It took some trial and error. And a few years back we found a recipe that started to pay off. From day 1, we have invested in content marketing at Buffer. Leo kicked things off on the blog back in 2011 and since then we've been through quite a few evolutions and tried many different tactics to build our audience. If you check back through our first posts, they contain great content but they weren't distinguishable from other social media blogs out there. At this stage - when we weren't getting hundreds of thousands or millions of views per month - we could've decided to focus elsewhere. Instead, we tried to do things differently and create our Buffer style of content. We pivoted from Twitter tips to broader social media tips. And in June 2012 we pivoted again. We began focusing on in-depth, well-researched posts that broke down potentially complex subjects into clear, understandable and highly shareable content. Things started to take off after this pivot. After some success with this style of post, the biggest jump in traffic came when Belle Beth Cooper joined the Buffer team, and we doubled down on producing unique content. If it wasn't for our early experiments, we may never have discovered the potential of this type of content and may never have unlocked all of the traffic (and conversions!) we see today. Leo and Belle were so great at discovering the potential of in-depth content. Another shift for us occurred a year or so ago when we came to focus social media marketing and content tips - paying particular attention to the visuals and images within our articles. More recently, Kevan shared that our social referral traffic has nearly halved over the past year. 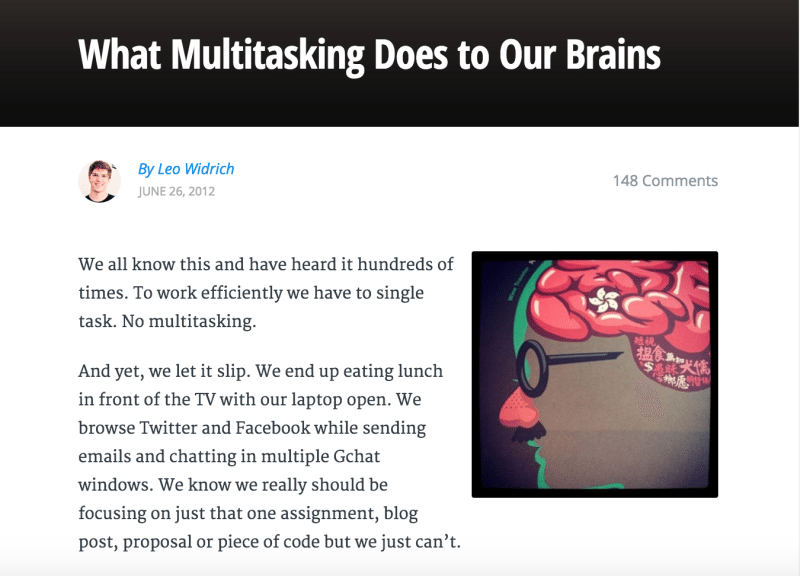 This post sparked a ton of discussion about our content both internally and externally. This debate gave us a chance to reflect and re-evaluate our content. It also inspired Leo to share our marketing manifesto. Since then, we've re-focused and started experimenting again. As Kevan explains: our blog is our greatest marketing asset. And we just keep changing it. Only time will tell if our new experiments will pay off. However, one thing is for sure - the hard work from the past years will go to waste if we don't continue to push ourselves and figure out how to continually keep evolving our content. I've learned from experience that if you work harder at it, and apply more energy and time to it, and more consistency, you get a better result. It comes from the work. -- Louis C.K. Success comes from the work that no-one sees. If you want to build an audience you need to put in a lot of hard work. Let's take Seth Godin for example. Before he was a best-selling author and marketing thought leader he was Seth Godin, just another blogger. Godin's blog has posts going back to 2002. But, as Ailian Gan points out on her blog, it's around 2006 where Seth Godin hits his stride and starts to sound like the Seth of today. That's four years of finding his voice and honing his skills. Another example is Nils Wagner, the man behind Hoopmixtape. Hoopmixtape's website and YouTube channel receive millions and millions of views each month. To stay on top, Wagner travels tens of thousands of miles yearly to gather footage of elite prospects, sometimes driving thirty hours straight and living out of his car for weeks at a stretch. Building an audience is hard work. And you'll need to put in the hours if you want to succeed. Sometimes we think that just putting out a consistent number of things will just create some outliers that'll help us win. Heck, I even believed this for a long time and advised people to just focus on quantity. I don't think that's true anymore. Yes, we need to output things at high quantity, but we need to treat every single piece of output as the one that'll be a breakout hit. Going back to the baseball analogy from earlier on, every time a batsman faces a pitch, they'll see it as a home run. Everything they have will go into the next swing. And to build an audience you need to feel that same way about every piece of content you share. You need to feel that everything you put out is excellent. Every post, every video, every image has the chance to be a hit. Without this feeling, you're not going to break through the noise. Quality shouldn't be confused with perfectionism. Perfect sits in your drafts for too long. Perfect causes delays. Quality is published consistently, without lingering. His procedure was simple: on the final day of class he would bring in his bathroom scales and weigh the work of the "quantity" group: fifty pounds of pots rated an "A", forty pounds a "B", and so on. Those being graded on "quality", however, needed to produce only one pot -- albeit a perfect one -- to get an "A". It seems that while the "quantity" group was busily churning out piles of work -- and learning from their mistakes -- the "quality" group had sat around theorizing about perfection, and in the end had little more to show for their efforts than grandiose theories and a pile of dead clay. It takes patience to build an audience, and it takes courage to keep putting yourself out there time and again. I think people believe that those who show up consistently have some sort of magic power or inherent ability. "It must come easy for him," they say. "For others like me, it's hard." Here's the reality: it's not easy for anyone -- even the people that make it look easy. In fact, if someone is making it look easy, they're probably working all the harder. When Unbounce launched, consistency played a big role in the growth of their audience as Co-founder, Oli Gardner, penned 300 posts for the Unbounce blog over a six month period. Consistently creating content was also critical to our early growth here at Buffer. Within Buffer's first nine months, Leo wrote around 150 guest posts, which were vital in helping us acquire our first 100,000 sign ups. Leo explained the importance of consistency over at Search Engine Watch: "Of course the early ones barely drove any traffic and only very gradually did things improve, I think that's very important to understand. It will take a while until you can find the right frequency of posting." Another great example of the power of consistency is Youtuber, Casey Neistat. When Neistat started daily vlogging he had around 520,000 subscribers on his YouTube Channel. Now he has over 1,500,000 subscribers. One of the best ways to achieve consistency is to set a schedule for yourself and stick to it. Most of us only create content when we're hit by a moment of inspiration. But if you're looking to build an audience, you need to be putting yourself out there regularly. I've always struggled with this one myself. But now, knowing I have to create content on a regular basis, means I can't skip writing. Instead of sitting down and wondering which days I'll write, I now have a schedule in place. Building an audience is something I'm continuously working on both personally and at Buffer. The rewards make it feel worthwhile - seeing people share your content and enjoy your work is priceless. In a way, this post serves as a public reminder to myself that I need to be dedicated and focused every day if I want to succeed and continue to build an audience. I'd love to hear your thoughts on this too. What are your feelings about growing an audience? What have you tried? What's worked? Drop a note below in the comments and I'll be excited to join the conversation.